Today's a great day with positives all around. I received a great report from my oncologist. My lung cancer is stable and my CEA/biomarker is within normal range and the lowest it's ever been. My next set of tests will be in three months to monitor for possible cancer progression. Hopefully there will be no change in the next three months. 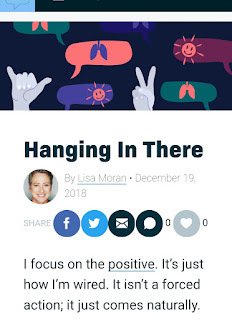 My first article was published at Lungcancer.net today. Click on the link or photo below to read it. One year ago, on December 8, 2017, I nearly died from a blood clot and hemorrhagic stroke. Some fast action, an emergency craniotomy and brain surgery saved my life. Last December I was in California with my boyfriend, Jeremy, and my mom for my Moyamoya direct and indirect bypass brain surgery at Stanford University Hospital. The plan was to have my surgery on December 5, spend two to three days in the hospital and then I would rest for a week with my mom in a rented apartment near Stanford University Hospital. After a week I would have a brain scan, a follow up exam with my neurosurgeon and be released to fly home. That was the plan. Sometimes you need a Plan B. This is what really happened. Please note, I was groggy from surgery and pain meds. So, this is my drug induced, stroke riddled, brain's way of recollecting the events that transpired. The surgery was a success. I spent a day and a half in the hospital after my surgery. My vital signs and blood pressure were stable. I was released to rest at our rented apartment. Jeremy drove us from the hospital to the apartment, stopping at a pharmacy to fill a pain medicine prescription along the way. I was tired but awake enough to send a couple texts to check in with family and friends to let them know I was doing well and out of the hospital. A day later, at the apartment, something went wrong. I was doing and feeling fairly well considering I had a craniotomy and major brain surgery less than 72 hours before. I was sitting up while drinking a smoothie for breakfast and talking with my mom in the living room. Jeremy was sleeping in a bedroom. All of a sudden I felt a quick, sharp, stabbing pain in the right side of my head. It caused a knee jerk reaction to hold my hand to my head and wince in pain. I could see the panic on my mom's face. I told her to calm down and it was nothing I hadn't felt before. That was a half lie. 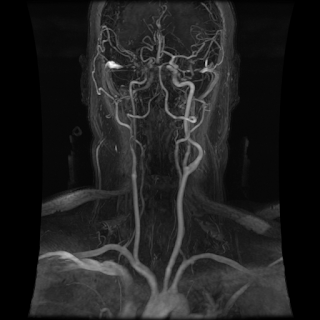 There were a couple times I had felt sudden pains in my head prior to the surgery, but nothing this severe. Then there was a second stab. It was even more painful than the first. I confessed the pain was nothing like before surgery. It wasn't like expected post brain surgery pain either. We called the neuro surgeon to report the change in my status. The pain continued and wasn't easing up. It was moving around my skull and I could feel it behind my right eye. I remember hearing a noise too. The sound of rushing water, wind shear or radio static between stations are the only ways to describe it. I lost track of my space and surroundings and I was feeling nauseous. I've heard stories of seeing the white light before you die. I wasn't moving toward that light. It wasn't in the distance. I was inside that light. I couldn't see Jeremy infront of me or our reflection in the vanity mirror. But I do know my body was physically standing in that stark white bathroom at that time. I don't know who called 9-1-1. But I do have this flash of a memory of EMTs asking me questions at the apartment. I can't remember which room I was in when they arrived or when they were talking to me. I don't remember going to the ambulance, the ride to the hospital or anything else from that day. I was rushed to Stanford University Hospital. I underwent emergency brain surgery to repair a brain bleed and evacuate a clot. I was lucky to be alive. Most of the time, people do not survive a hemorrhagic stroke. Whatever happened that day, from the apartment to the ambulance to the operating room, I can say, I sure was at the right places at the right times. I can also say, I'm living proof that the power of prayer and positive thoughts can work miracles. I was in the Stanford hospital for twelve days, pretty much unresponsive, before showing signs of improvement and being transferred to an acute rehab facility at Santa Clara Valley Medical Center. When I arrived, I could hardly respond when anyone came to my room to speak with me. I had Left Side Neglect. It impaired my vision. I would lose sight of objects, like my phone or a water pitcher if it was placed in front of me and off to my left side. I couldn't feel or move anything on the left side of my body. I couldn't even wiggle my left toes. Movement returned to my left arm first. I couldn't use my hand, but I could move my arm at my shoulder. I eventually regained movement in my leg and foot. There were days I was aware and alert and not curled up in a ball, asleep in the bed. I started occupational, physical and speech therapies while at SCVMC. I walked out with a cane on my discharge date, which was a week earlier than projected by my rehab medical team. It was also totally unexpected since a wheelchair was assigned to me prior to my discharge date change. Since returning home in January after my stroke, I work on cognitive thinking and memory therapies every day. I continued to make improvements throughout the year. Being off of work and at home, we decided it was a good time to get a dog. We rescued an 8 week old black lab mix girl named Laynie on May 1. She keeps me on my toes and keeps me on a schedule. Both are good for my stroke recovery. 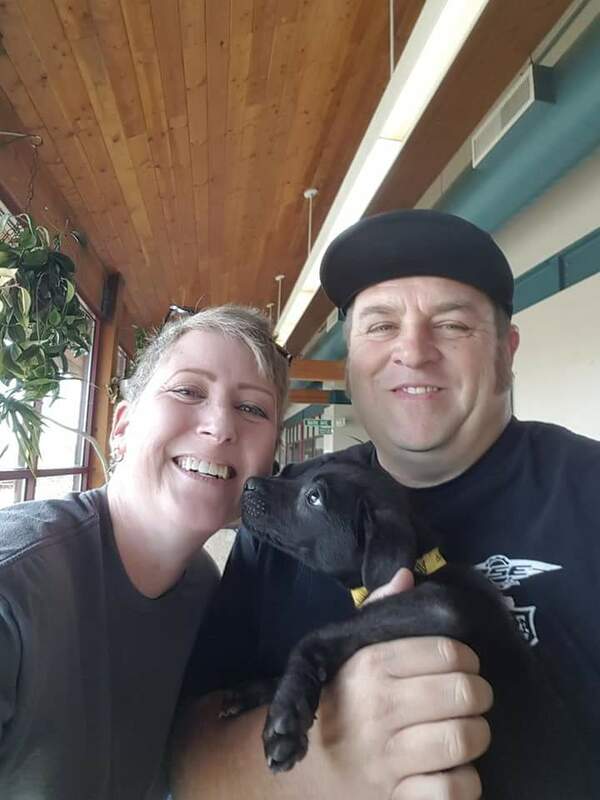 Adoption day for Laynie May. When she first got to our house it was almost like both of us were learning and resting at the same level and at the same pace. We would go for a walk and both run out of energy and slow down at the same time. We would get home and both of us would nap. We gradually increased our exercise time and kept on napping when needed. The summer was filled with long walks in the neighborhood with Laynie. While I was preparing for this year's Run the Rocks, she was a growing dog and needed to work off that extra puppy energy. 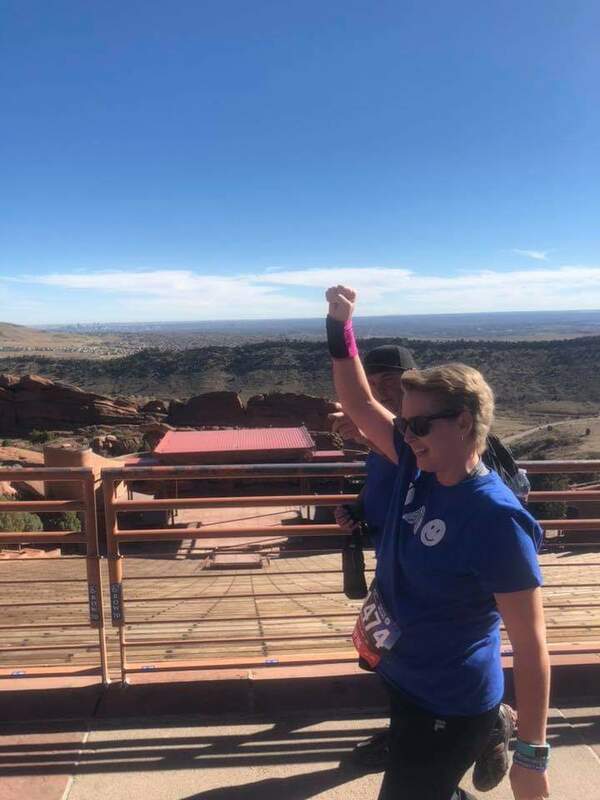 Run the Rocks is the most physically challenging 5k I've ever done. I was determined to complete the 5k this year. It was my 4th time participating in this event. Out of all 4 years, this year, by far, was the hardest to complete. Of everything involved with my Medical Apocalypse, I think it was just athe combination of lung cancer, moyamoya and recovering from the stroke that made it so difficult this year. Run the Rocks finish line. The Pikes Peak Browns Backers hosted a Whiteout Game for Lung Cancer Awareness at the beginning of November for Lung Cancer Awareness Month. It was a great event with many club members participating and wearing white. I shared my lung cancer story at this event as well. I ended the fall with a trip to Mayo Clinic in AZ. I never got my 6 month Moyamoya bypass surgery follow up scheduled with Stanford University Hospital. That's a whole other blog post in itself. I was concerned about disease progression and wanted to verify the bypass was holding up. My first trip to Mayo was a series of meetings, tests and scans. I met with my new neurosurgeon. 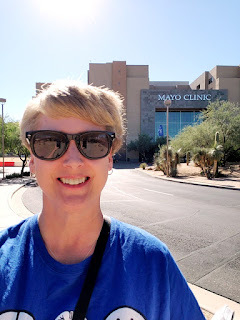 We discussed what led to my initial Moyamoya diagnosis, my current symptoms and the tests that would follow that appointment. I have been experiencing numbness in my right leg and foot. That side was not effected by the stroke. I had MRIs and MRAs of my head, neck and spine to rule ot any neurological causes. Good news, I have not had any new strokes! I have good blood flow from the direct right carotid artery bypass. The left side looks still looks good. The areas of numbness may have to do with my spine. L5 is where the lung cancer tumor was and where I had radiation. Because it is not brain related, it may be spinal damage from the radiation or possibly cancer activity. They couldn't rule cancer in or out by an MRI. I have a CT scan and lab work in a couple weeks. If my lung cancer biomarker numbers are elevated, I'll get a PET scan from there. I was the 2nd participant in a Whole Exome Seqencing research study on Moyamoya Disease at Mayo Clinic. They are testing Moyamoya patients to see if there is a common denominator. They are also researching to see if there are specific gene mutations that cause Moyamoya. Im anxious to find out if I have a known Moyamoya gene mutation. We already know I have two gene mutations driving my lung cancer. 2019 is just around the corner. I can't wait to see what the new year brings my way. I know one new endeavor is in the works. I've been considering this for some time; I'm going to start writing articles for lungcancer.net. I will continue to write for this blog and I will share my lungcancer.net articles here. Im excited to get started. You will know here as soon as my first article is published. November 2018: I have posted about my different diagnoses throughout this blog. It's been a while since I've posted about being diagnosed with lung cancer. It all started three years ago in August 2015. I was in the first years of a serious relationship with my boyfriend, Jeremy. We were passed that milestone moment when you realize your significant other is your forever person. We were planning our future together and talking about getting married. It was also the beginning of my career as a letter carrier. By choice, I was on walking routes. I was walking approximately 35-40 miles a week. I would walk anywhere from 6 to 12+ miles a day. Carrying mail was more than a job. It was my career and my passion. I would run at least one 5k (3.1 miles) a week after work with my runner's club. I was enjoying running for the first time in my life. There were times I'd run two or three 5k's in a week. Running wasn't just the annual 5k for charity any more. As active and healthy as I was, I had a persistent cough and some random breathing issues. There were a few times between late 2014 and July 2015 that I felt a heaviness in my chest, something similar to bronchitis. Each time there seemed to be an acceptable explanation (post nasal drip, virus) to justify the breathing problems. It didn't seem too serious at the time. When breathing issues interfered with exercising and running, I decided to get things checked out. I went to a doctor for my breathing problems. I had a chest x-ray. The result...a mass in my right lung. Further testing revealed a devastating diagnosis. We heard the words, “inoperable”, “incurable”, “terminal”. What seemed to be minor turned out to be inoperable, incurable, stage iv lung cancer. It was late stage, stage 4, non small cell lung cancer. At the time of diagnosis, lung cancer had already spread throughout both lungs and to my spine. How long to I have to live? How did I get lung cancer? Statistics said I had a 3 to 5% chance of living one year. Lung cancer in young healthy adults, especially women, was on the rise. My lung cancer is caused by the EGFR gene mutation. It’s not genetic or something I inherited from my parents. It’s genomic, something in my DNA has changed and mutated. The mutation meant I would have targeted therapy treatment instead of iv chemo. Days before we heard, “incurable” and “terminal”. Now we heard something promising. I had a chance at living a normal life. It’s almost like, “normal life” echoed as it came out of my nurse navigator’s mouth. Over the years my treatments have been targeted therapies and radiation treatments to my lung and spine. I take a chemo pill once a day that targets the mutation that is driving my cancer. I was able to stay at work and continued living my active otherwise healthy life. Things were as normal as they could be with quarterly PET scans thrown in to monitor disease progression. Or in my case, we watched tumors and nodules shrink and disappear. the targeted therapy did it's job. I was No Evidence of Disease within 8 months. Our moment of relief lasted 6 months. Then the nodules and tumors returned in my lungs. We monitored that growth for 10 months. In the mean time I had a bronchoscopy biopsy to test for a new mutation. I switched targeted therapies because I tested positive for the t790m mutation. Life is back to normal, for now. Well, as normal as it can be with quarterly scans and blood labs thrown in to monitor for disease progression. I've never been the type of person to remember exact dates of bad or traumatic events. I know my father passed away in January when I was a child. But i can't tell you the exact date. It's the same thing with other family members and friends through the years. Sometimes i can remember what season it was with no memory of a particular month or day. So, every year when winter rolls around, i don't focus on the calendar. January doesn't bring up old memories or sadness. Sometimes, i don't think of it at all. That all changed after Lung Cancer and Moyamoya. There are some dates I will now never forget and always will remember and celebrate. I will never forget the date, August 14, 2015. I have remembered it and acknowledged this date every year since. I can't tell you what day of the week it was. I do know and remember well that it was a work day for Jeremy and me. We were at the tail end of the multitude of tests that i had undergone over the previous weeks. August 14, 2015 was the results appointment for the final test, a PET Scan. Up to this point, we only knew about one lung tumor in my upper right lung lobe. This was the appointment we would find out how active the cancer was. Being naive and having no first hand experience with cancer, I thought that meant if that tumor was a weak or strong tumor. That sounds so funny to me now. It goes to show how much we just didn't know at that point. We had been focusing on the fact that I was a good candidate for surgery to remove the tumor. We both thought this was the appointment we would be given a surgery date, recovery time and the info for any follow up chemotherapy or radiation treatments. Jeremy and I went to work that day. We broke away for a lunch meeting with my Memorial Hospital oncologist. We were going to return to work after the appointment. This was the appointment we learned I was being diagnosed with STAGE 4 non small cell lung cancer. My cancer had spread (metastasized) throughout both of my lungs and to my spine. We heard the words, INOPERABLE, INCURABLE, and TERMINAL. We didn't return to work that day. Why would I want to remember, acknowledge and celebrate such a day? I know some people that never talk of their diagnosis. Some only refer to it as, "The C word". To me it's almost like a birthday. I don't remember being born, but I still celebrate adding another candle to the cake every year. I hate Lung Cancer and I wish I could forget it. But you're going to find me every year celebrating my CANCERversary and the fact that I'm still surviving this inoperable, incurable, terminal disease. 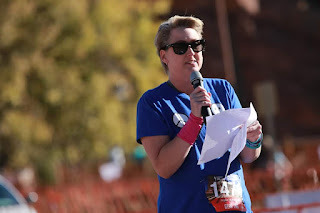 Since my last CANCERversary I've had a few notable events take place. It's been one helluva year! Brain surgery to treat Moyamoya. Attended the Lung Cancer Alliance National Advocacy Summit in Washington, D.C. and participated in six meetings on Capitol Hill with Colorado members of congress. They say the truth is stranger than fiction. I wish I was making this stuff up. Sometimes I can't believe everything that has happened to me over the last three years. Then i see this recap of just my last year and realize it's incredible I'm here and able to blog and share my experiences. I think it's fair to say the Lung Cancer Alliance National Advocacy Summit made the biggest positive impact this last year. Lung Cancer advocacy has been important to me since my 2015 diagnosis. I've known and shared the awareness facts and grim statistics of how Lung Cancer is the number one cancer killer but receives the least amount of government funding. 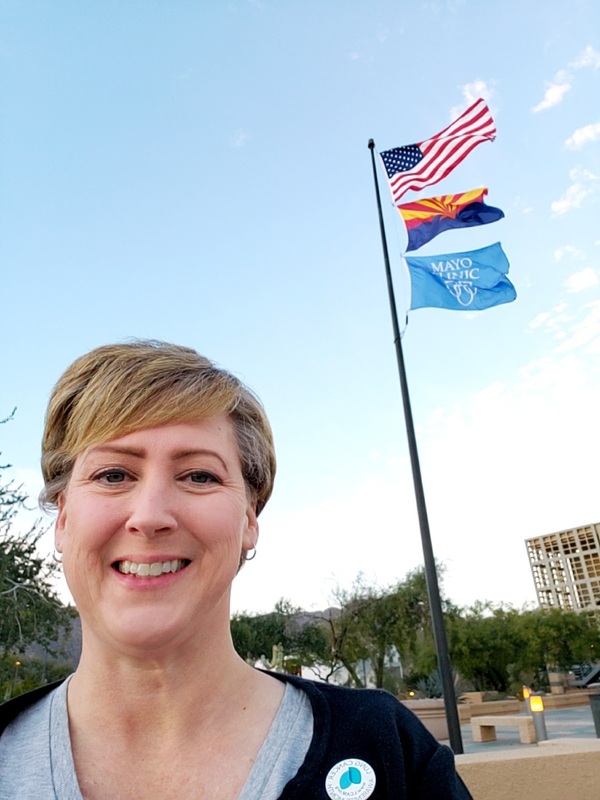 Lung Cancer Alliance gave me the opportunity to change this, for myself and everyone else diagnosed with Lung Cancer in the United States, which could in turn effect Lung Cancer patients around the world. Capitol Hill changed me and I changed Capitol Hill. 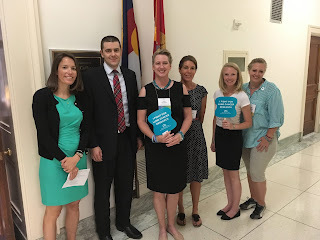 As a result of my July trip to Washington, D.C., Senator Michael Bennet of Colorado is now a co-sponsor of the Women and Lung Cancer Research and Preventive Services Act of 2018 (H.R.4897 or S.2358). I keep referring to this as, "My bill". I mean, in a way it IS my bill. It effects my future treatments. It could potentially aid in the discovery of the next EGFR drug to keep me alive. It could end or lessen the stigma associated with Lung Cancer. This squeaky wheel will not stop until Senator Gardner and Representative Lamborn are on board too. Keep checking your inboxes, gentlemen. 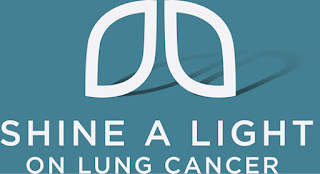 This year my CANCERversary party is gong to be my first Shine a Light on Lung Cancer fundraising event. It will be a combination of an online fundraising campaign and an August 18 party in Colorado Springs. CO, USA. Donations will benefit the Lung Cancer Alliance. Please join me in this celebration by making a donation, whether in person or online. No amount is too small. I have now experienced the most grown up and responsible event in my adult life. 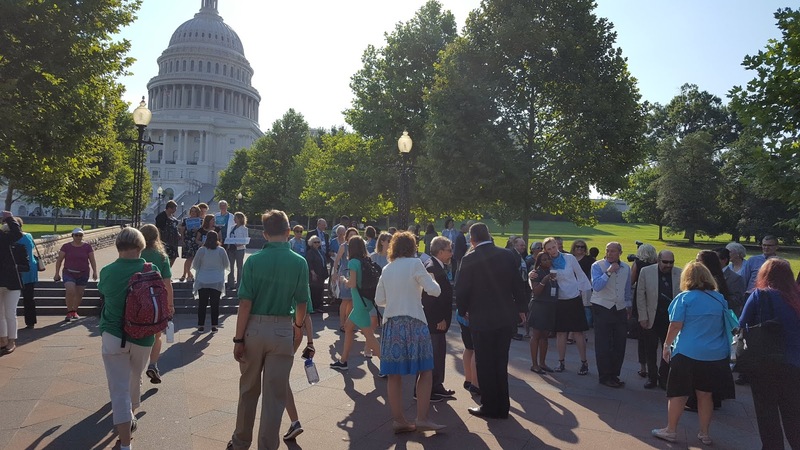 This week I had the opportunity to go to Washington, D.C. with Lung Cancer Alliance for National Lung Cancer Advocacy Day. Being a hippie at heart and a registered Independent, making a plunge into politics never piqued my interest. 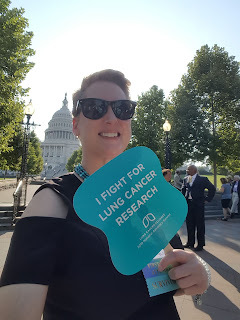 But when your life is on the line, you put on a big girl business dress, storm Capitol Hill with over 100 other lung cancer advocates and attend six scheduled meetings with congressmen and senators to demand a change in policy. 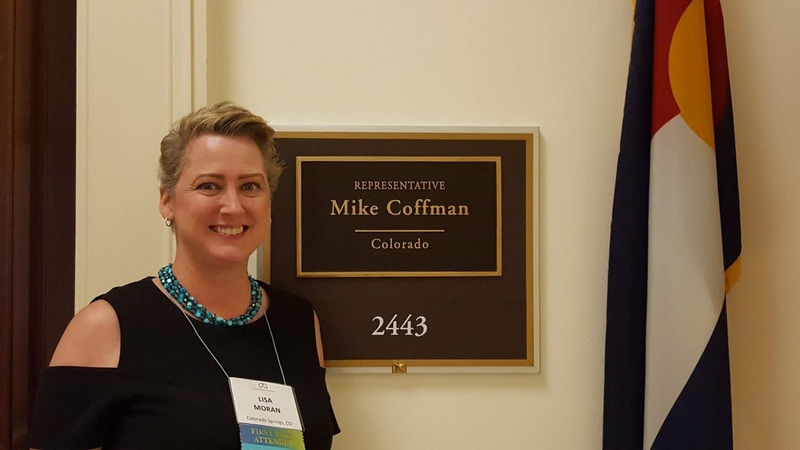 On July 11, 2018, I met with representatives from the offices of four Colorado congressmen and both Colorado senators. 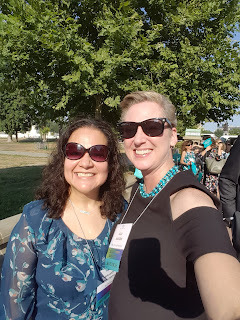 Gabriele Wright from Lung Cancer Alliance, three staff members from the International Association for the Study of Lung Cancer (IASLC, located in Aurora, CO) and myself operated like a well oiled machine as we opened the eyes, dropped jaws and educated everyone we met in D.C. I was changing the face of lung cancer as we put a face to the bill. 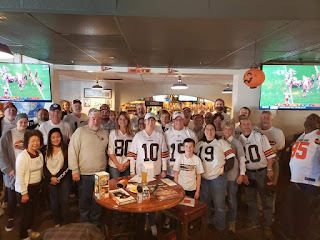 I shared my lung cancer story of how life was for Jeremy and me the summer I was diagnosed with stage iv non small cell lung cancer caused by the EGFR mutation. We had made it past the point of a relationship when you know you are with your forever person. We were talking about getting married. I was three years into my career, the best job in the world, as a City Letter Carrier. I was on walking routes by choice. I discovered the love of running. I had joined the Jack Quinn's Running Club in downtown Colorado Springs. On Tuesdays I would run a 5k with JQRC after a full day of work. Then BAM!!! !, Terminal, stage iv lung cancer enters the picture. I explained my treatment has been radiation and targeted therapies in the form of a (chemo) pill, that I take once a day. I told them the amount of hope that I had when six lung cancer drugs were fda approved the year I was diagnosed, (2015). Five of those drugs were after my August diagnosis. I've been on three drugs over the last three years. Two of them were FDA approved in 2015. One, Tagrisso, is the treatment I'm on now. We explained lung cancer is not just a smokers disease.70% Of lung cancer patients now are never smokers or quit decades ago. More and more new lung cancer cases are young, athletic, healthy women, like me, and doctors don't know why. 433 Americans are dying every day from lung cancer. Lung cancer kills more than breast, colorectal and prostate cancers combined. But at the same time Lung cancer is grossly underfunded compared to other cancers. I've already sent my thank you letters to the representative's staffers that took the time out of their schedule to speak with me and requested a meeting at Senator Bennet's Colorado Springs office since he was not available to meet with me in person in Washington. I happen to know exactly where that office is located because that stop was on my mail route for four years. Everyone in the U.S. can help support my efforts to change the future of lung cancer research. You can call or write a letter/email to your representative. Tell them my story and/or your personal connection to lung cancer. Let them know the importance of the Women and Lung Cancer Research and Preventive Services Act, especially now as I am running out of FDA approved treatment options. At this point, when the cancer outsmarts my current treatment, There is no other FDA approved targeted therapy. If politics has never piqued your interest and you don't know who your representatives are, Click HERE#. Enter your zip code and click on the representative to see their contact information. Diagnoses Divided, Where Does A Medical Apacolypse Belong? After my 2015 lung cancer diagnosis, I found comfort and friendship within the online lung cancer community. It was a sense of comradery. We were all in this together. The common adage: No One Fights Alone. After my 2017 Moyamoya diagnosis, I didn't feel like part of my lung cancer community anymore. I was very isolated. In addition to incurable stage iv lung cancer, I had a second incurable disease that nobody else had or even heard of before. With that came a new set of symptoms, anxieties and feelings I didn't share or discuss with my lung cancer peers. I put myself in my own category, separate from my lung cancer friends and online support groups. I searched online for support from the Moyamoya community. I was looking for the comradery I found before when diagnosed with a scary, incurable disease. I found I was an uncommon case. My Moyamoya was diagnosed without a neurological event like aneurysm or stroke. Because Moyamoya is so rare, the support group options were limited. Most of the people posting in the Moyamoya groups are parents of small children and babies diagnosed with Moyamoya or adults that have experienced strokes or other neurological events that lead to their Moyamoya diagnosis. I couldn't relate to them on any level. I didn't feel like part of the that community either. I was conflicted and alone with my thoughts, living with two incurable diseases. I was my own with no sense of community. I felt even more isolated after my December 2017 stroke. Not only did I survive a hemorrhagic stroke, I recovered rapidly and continue to overcome my deficits. I was having a hard time relating to others and their stories. combination of diseases and stroke deficits. The last couple of months have changed my thoughts. I have a new sense of self and a renewed sense of community, in all my communities. As I was feeling isolated, I found my stroke "twin" in an online stroke support group. We both had our strokes on the same day. We had similar outlooks and attitudes about stroke recovery. Together, we explored in person stroke support group options in Colorado Springs. Through this connection I found a brain injury/brain disease support group at Memorial Hospital. They meet once a month and each meeting has included guest speakers, tips and topics that I found helpful in my stroke recovery. 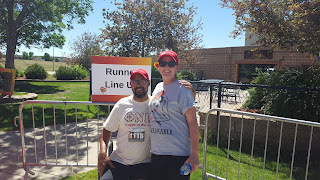 My twin connected me with another stroke survivor, Mike, in Colorado Springs. He's now my friend, my stroke brother. I follow his progress and accomplishments throughout his stroke recovery. Walking is an important exercise in both our recoveries. 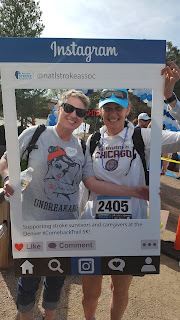 We recently cheered each other on during two different stroke walks. 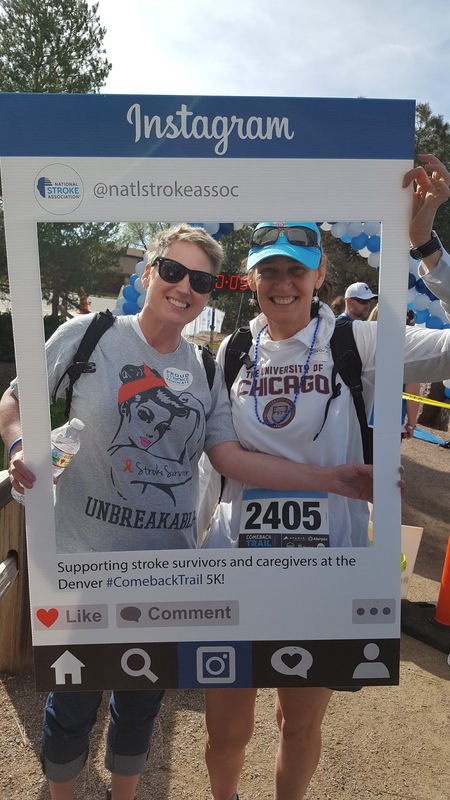 One in Denver, The Comeback Trail 5k for the National Stroke Association. The other was this last weekend at the Heart and Stroke 5k Walk for the American Heart Association. 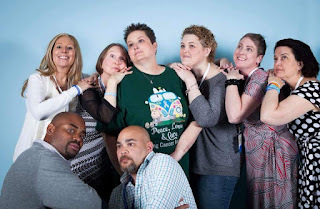 I was able to attend the Lungevity Hope Summit in Washington DC at the end of April 2018. I was awarded a full travel scholarship thanks to the donations from my Hope Summit Survivor Challenge. The trip to DC for Hope Summit was quite an accomplishment. I utilized the airport wheelchair assistance program, by myself, for the first time. That was helpful. I was able to get to my gates and make my connecting flight at O'Hare on time without any troubles. Navigating in unknown territory is a challenge with my vision, cognitive and executive thinking deficits. 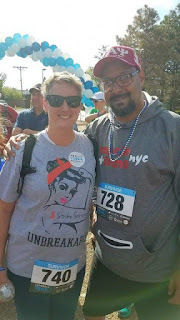 I realized the lung cancer community was with me the whole time, praying for me and cheering me on through my Moyamoya diagnosis to my surgery, after my stroke and into my recovery. It was still the, No One Fights Alone adage. Although my Medical Apacolypse is a combination of many things, I'm learning I'm not alone. I can break it down to my individual diseases and deficits and reach out to those individual communities. And on some days, like May 6, 2018, all those communities will collide. May 6 was World Moyamoya Day. I walked the Comeback Trail Stroke Walk with stroke survivor, Mike, and lung cancer survivor, Ali. I've never really questioned where my strength comes from. People ask, "How do you do it?, when referring to my attitude, resilience and perseverance while dealing with my continuing, life threatening, medical diagnoses and complications. Someone coined the more than appropriate term, 'Medical Apocalypse', to describe my compilation of ailments and diseases. Throughout life my general feeling was, my strength came from within. I never questioned it or doubted it. I was lucky to have it. I met Marilyn Pinaud in the summer of 2016. We were both speaking and sharing our lung cancer stories at a Lung Force Walk in Denver, CO. Although both of our stories were different, they both started with the same underlying storyline. If our stories were two different newspaper articles, they could have the same headline, "Active, Otherwise Healthy Woman Surprisingly Diagnosed with Lung Cancer"
Marilyn and I didn't live close. I didn't see her very often. We both periodically attended the same lung cancer events. Marilyn was my Facebook friend. I followed her posts about her artwork and her lung cancer treatment plans and options and sometimes, lack of options. Since we didn't see each other often, one particular visit in May 2017 was special. I was at University of Colorado Hospital for what should have been a routine, outpatient needle biopsy. My lung collapsed. I was admitted for my first ever overnight hospital stay, . Marilyn happened to be at the cancer center while I was in the hospital. After her appointment she found my room and stopped by to check on me. Fast forward to another hospital stay for a different reason. December 20, 2017: I was admitted to an inpatient acute rehab in California following a hemorrhagic stroke and emergency brain surgery. My sister and boyfriend were posting updates on my condition on social media. I had contracted two infections while in ICU after the stroke and emergency surgery. I was very sick and weak. I lost feeling on my left side of my body. I was curled up in a ball in my hospital bed, asleep most of the time. I couldn't wiggle my left toes. I couldn't move or lift my left leg. December 26, 2017: I stood during my physical therapy session. December 27, 2017: I walked down the hall of my hospital ward. December 28, 2017: Two things happened on this day. I received news that my discharge date would be eight days earlier than originally planned because I was recovering so quickly. 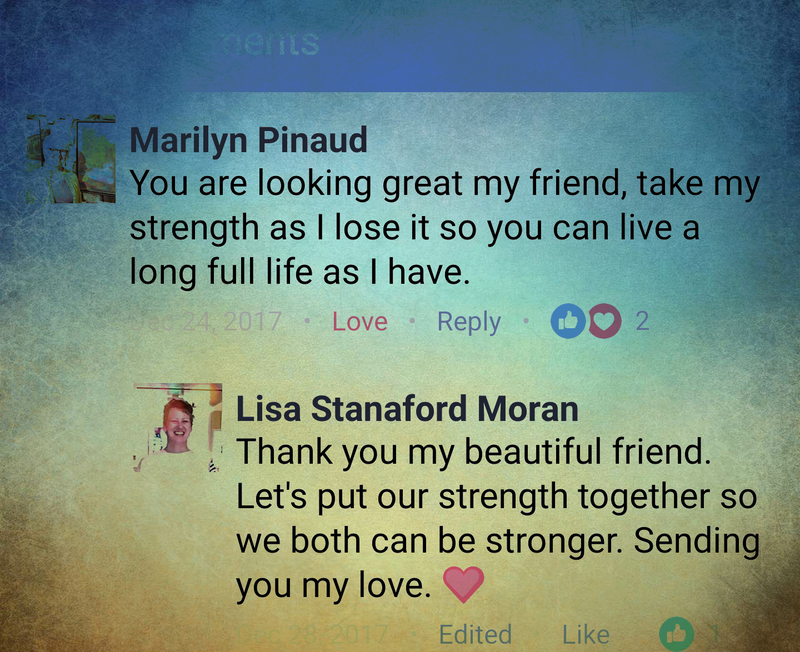 I also read a moving message Marilyn Pinaud had sent to me via Facebook, four days earlier, on December 24, 2017. She had offered the strength she had left, at the end of her own life, to me as I was recovering from my stroke. How do you reply to a message like that? I wanted to thank her for the sentiment but I didn't want to think of another one of my friends losing their life to lung cancer. January 3, 2018: I was discharged from the California acute rehab and flew home to Colorado. I was home for about a week before an extreme fatigue set in. The rapid recovery I was experiencing in rehab had come to a screeching halt. I was getting weaker and weaker by the day. 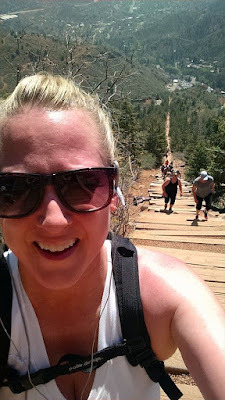 It got to the point that I couldn't take more than a few steps without my heart racing and getting out of breath. I had an appointment with my primary care physician. I told him we needed to figure out what was causing the lethargic type fatigue. Because of the Medical Apocalypse, it could be one or a combination of multiple things. Was it new medications? Lingering infection? Or was it lung cancer progression? He listened to my heart and lungs, checked my oxygen level, and ordered bloodwork and a chest xray. The xray showed no pneumonia. January 25, 2018: Just as miraculous as my California recovery, two days after seeing my physician, I woke up completely frefreshed and energized. That afternoon my doctor called. I had to go to the ER to be examined for a possible pulmonary embolism (blood clot) in my lungs. Even though my energy had returned and I didn't have any shortness of breath the ER visit was necessary. The ER ct scan showed no pulmonary embolism. Several days later I learned of Marilyn's passing. She died on January 25, 2018, the same day my energy and strength was renewed. 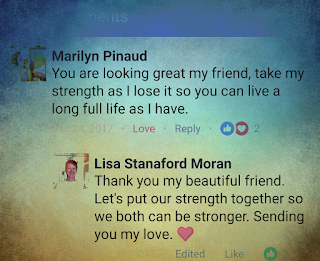 Did Marilyn Pinaud give me her strength as she left this earth? I can't say she did. But I can't say she didn't. The body is the easy part. It's just little ol' me, standing over here, doing my thing. The Angels and the Universe are a little harder for me to fathom. The Universe is too vast and complicated for me to try to visualize or comprehend. What is an angel? Who are my angels that i speak to every day? Sometimes I picture my angels as family members and loved ones that have passed away. 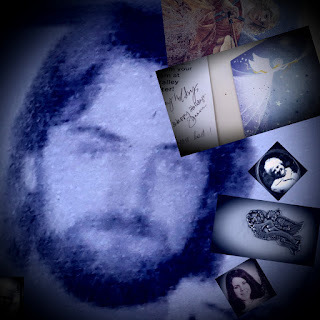 Sometimes I visualize an angel from a set of Christmas cards that I purchased many years back. Now, sometimes, Marilyn Pinaud comes to mind. R.I.P. Marilyn Pinaud. May you be painting your greatest masterpiece on the largest canvas you've ever seen. The next time I see one of those unforgettable Colorado sunsets or multicolored morning skies, I'll wonder if your brush was behind it. My surgery was on December 5, 2017. The surgery was a success, returning blood flow to my brain. But it was too much for my blood vessels, possibly weakened by my lung cancer treatments. My hemorrhagic stroke was on December 9, 2017. I was transferred from Stanford University Hospital to the Santa Clara acute rehab facility on December 20, 2017. The original plan was to release me on January 11, 2018. I would need a 24 hour care nurse and a wheelchair. When i was in rehab, Jeremy and i knew what we had to do. I had to work hard and gain my strength. Jeremy had to prepare the house for my return. That would mean ripping out the carpet, installing ramps, handrails and safety bars throughout the house. The wheelchair was never a consolation prize. It was my ticket home to Colorado and back to Jeremy. But something maraculous happened hile i was in California. I regained movement on my left side and I BEGAN TO WALK!!!!!! I was released and returned to Colorado on January 3,much earier than the first proposed date. I can't believe I've been home this long. My time and days are still running into each other. While I was in California, Iwould think about returning to Colorado and to my boyfriend, Jeremy. My best wishes and daydreams don't stack up to the reality of being here and in his arms. Lyrics: Home by Phil Pillips. This song was released when Jeremy and I started dating. When I was admitted to Santa Clara I was very ill, recovering from two infections I contracted while at Stanford University Hospital. I was on antibiotics for both infections and all I did was curl up in a ball and sleep. I had no movement on my left side. I couldn't tell when the doctors touched my left leg or foot. I couldn't wiggle my left toes or move my left foot when they asked me to. Since my return, Ive enjoyed the new changes to the house. 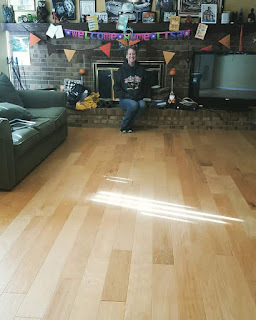 But you don't know and I can't describe the feelings I have knowing why the carpet is gone and why we have hardwood. I left a house and I returned to our home. i returned to our new beginning. I returned to yhe rest of my life! I Was supossed to return home in a wheelchair. At the rehab facility, they ordered me a wheelchair. It was placed in my room with an invoice stating this was my wheelchair for my return home. There was a tag on thr chair, BREEZY, That's what I called it, Breezy. Breezy and i were in this together. if my way back to Colorado and to Jeremy was in a wheelchair, that's how it would be. I have a lot of hard work and rehab ahead of me. Next week I start the first of many outpatient occupational and physical therapy sessions. I have limited use of my left arm and hand with little to no sensation. My vision is impaired because of left side neglect. I'm unable to drive. 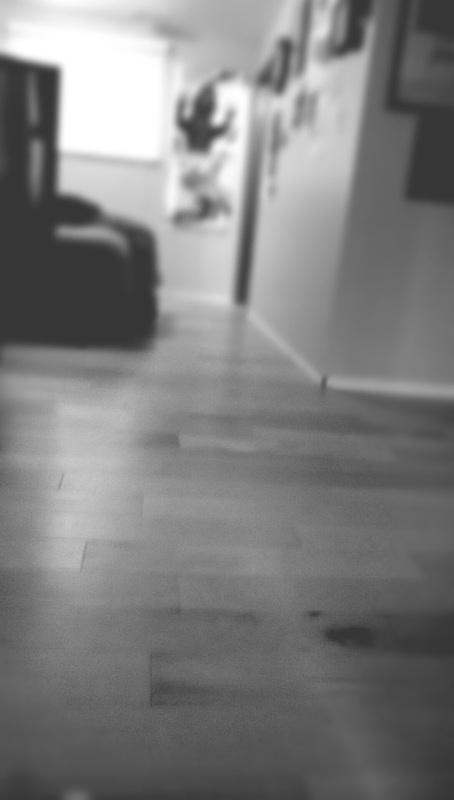 I can walk inside the house unassisted. I can walk around the block, get to appointments and run errands with a cane if someone observes me and drives. If I were to grade my current attention span and life skills, I'd be a combination of a10 year old boy the day after Halloween and Anna Nicole Smith during the time she filmed that reality show. There are a couple of cosmetic things that need to be completed around the house too. 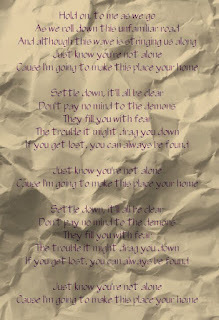 But if you ask me, it's prefect for my return home. 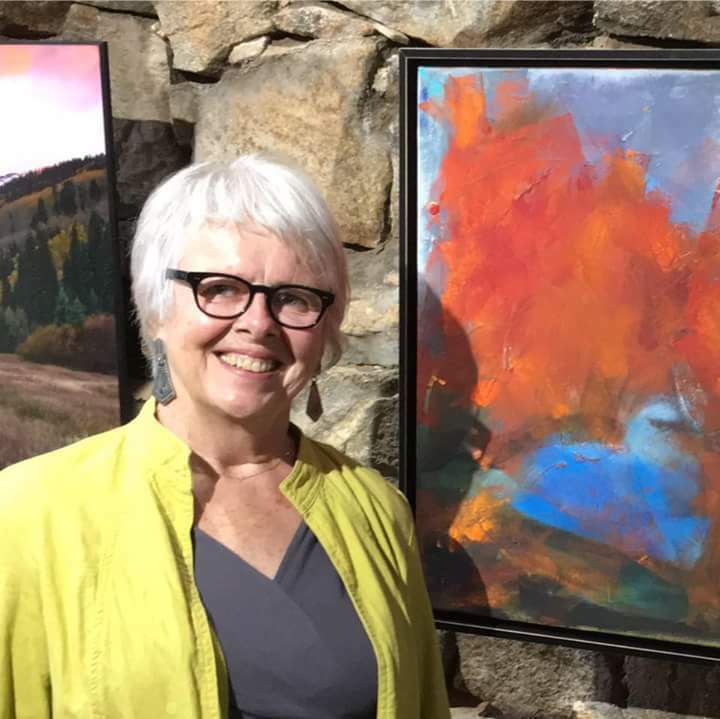 I left Colorado on November 28 for my pre-op appointments at Stanford University in Palo Alrto, CA. My surgery was December 5. My stroke was on December 9. I was admitted to the Santa Clara Medical Center acute regard ehab on December 20. I was discharged from the acute rehab facility on Jan 3. I can't believe I've been home this long. Time and days still seem to be running together. For weeks, in CA, I would imagine what it would be like to be back with Jeremy and to be in our house, sleeping in my own bed. My best daydreams and wishes don't stack up to the reality of being here and being in his arms.